Tale of Tales, the indie studio that brought you The Endless Forest, The Graveyard and The Path, has released its first new project since 2009. "The Intergalactic Holocom Transmitter II is a state of the art virtual reality simulation and communication unit specifically designed for deep space conditions. No matter how large or small the polypurpose deck of your orbital station, the IHTII can be configured to fit any situation," is how the website for Tale of Tales' new BientÃ´t l'Ã©tÃ© begins. "Life on an orbital station does not need to be lonely or boring anymore. And our research has shown that exposure to psycho-motoric induction has a beneficial effect on the vitality and longevity of most organs of its user." It's not terribly informative, but that's how Tale of Tales rolls. The indie studio from Belgium is known for its experimental approach to games and while a lot of it, with all due respect to the "games are art" crowd, is pretty weird, its 2009 release The Path - until now, its most recent game - ended up on Susan Arendt's "Five Faves of 2009" list, an impressive accomplishment. And now it's time for something new. 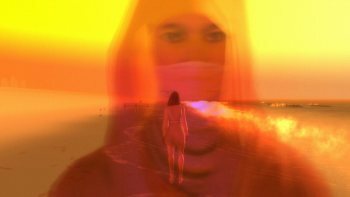 In BientÃ´t l'Ã©tÃ©, players control an avatar, male or female, walking along a simulated beach as "poetic phrases of love and loss" roll in with the waves. You'll eventually enter a building, presumably at your discretion, where you'll exchange moves and the words you've collected on a chessboard with someone else on the internet. You have no control over who the other person is and won't even know his or her identity, as the matchmaking is all handled automatically by the game. It's not much to go on and I won't pretend that I "get it," especially since I haven't played the game, but the focus on human interactions and the interactions of humans with the world around them is a common Tale of Tales theme. "Life on an orbital station can get very lonely," co-founders Auriea Harvey and Michael Samyn said in a statement. "The pay is decent and the views are spectacular. But to spend so much time without human contact in a freezing vacuum surrounded by indifferent technology can come to haunt one at some point. This is what originally inspired us to build the first Intergalactic Holocom Transmitter." It certainly sounds intriguing. To find out more about BientÃ´t l'Ã©tÃ©, although there's not a whole lot more to find out about at this point that doesn't involve actually playing the game, head over to tale-of-tales.com.